Even more Five Nights at Freddy's Sister Location characters coming your way! These characters might terrorize you, but have no fear, they are now featured as a cuter, more manageable size. Now joining Pint Size Heroes! Everyone is going to be hooked on opening up Pint-Size Heroes to find their favorite character. Created with Funko's signature flair for designing charming stylized vinyl, we've taken our favorite parts of Pop! 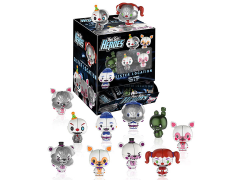 and Dorbz and made them into an even smaller package. Possible blind bag figures include: Freddy, Freddy Open Face, Foxy, Foxy Open Face, Baby, Baby Open Face, Ballora, Ballora open face, Ennard, Ennard Open Face, Dark Springtrap, and Lolbit.